This week’s update is… very short. 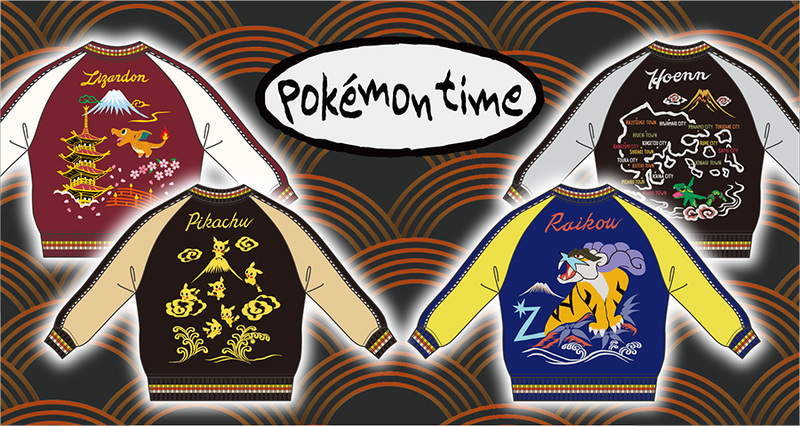 Along with the traditional Pokemon Time line-up, a separate set of merchandise with a traditional skajan theme will also be going on sale as part of the Pokemon Time promotion from August 25th (Saturday). Known as “souvenir jackets” and based off of traditional American letterman or varsity jackets, skajan became a thing near the end of WW2. American soldiers wanted something to bring back with them from Japan and would request these jackets hand-embroidered with traditional oriental symbols. The three most common motifs were Eagles (representing the US) and Dragons or Tigers (representing Japan). The original jackets were made of dyed parachute fabric, but evolved over time to include rayon, acetate, polyester, and silk. 1) “skajan” is short for “yokosuka jumper” with jumper being the Japanese term for the jacket and Yokosuka, Kanagawa being the supposed birthplace. 2) “skajan” is short for “sky dragon jumper” as Chinese dragons were a common motif stitched on these jackets. Although these jackets were originally created as simply souvenirs to commemorate time spent abroad, the jackets were later adopted by working class youth as a form of rebellion in post-war Japan. Consequently, the jacket became associated with gangs and delinquency. Although now a days the jacket is once again seen mainly as a fashion item, it is still a common uniform in Yakuza films.